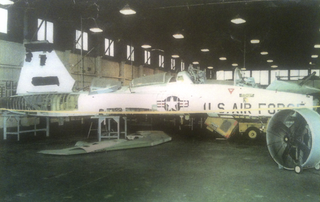 Former USAF Northrop T-38 Talon ran when parked. Only 125k bones on AirplaneMart. Hi, . All the project pictures were taken to keep track of parts,not intended to be glossy photos of parts for sale. There are two wings, dash 23 and dash 29, I believe the dash 29 wing is the only one in civilian hands, a 15,000/hr wing with a current time of aprox. 800/hrs +-.... The cost $600,000.00 to USAF. The project collection of parts spans over the past 15 years . Our fuselage has a current IRAN and we have a new entire wiring system in the original seals. A complete nose section including, doors and extra skins nose cone and pitot tube, and brakes are the latest the USAF has to date and are self adjusting type for greater braking capabilities. A USAF remanufactured air cycle machine still in the original create, also a 2nd air cycle machine taken from a flying aircraft (disassembled). Gear doors, nose and mains, wing leading edges restored and in creates, (4) four new ejection seats with parachutes with survival seats along with class room mock-up of instrument panels and other class room aids and HSI mock-up regarding instrument flying. Also fuel tank bladders and plumbing. We have the MX manuals, inspection cards and cockpit checklists, box of control stick grips, 12~14 ea. there are so many parts I don’t recall all of them. This restoration project would be a COST EFFECTIVE and TIME SAVING restoration for someone. These parts are stored in several warehouse storage facilities in various locations (2) in the US, the project price reflects a reduction in cost for transportation to the buyer. Since I am not a parts dealer and our only goal was to make a flyer from this project, I would make sure that every item no matter how small or where the location that I have obtained would reach the buyer and be included in the sale. My only request would be to get a ride.